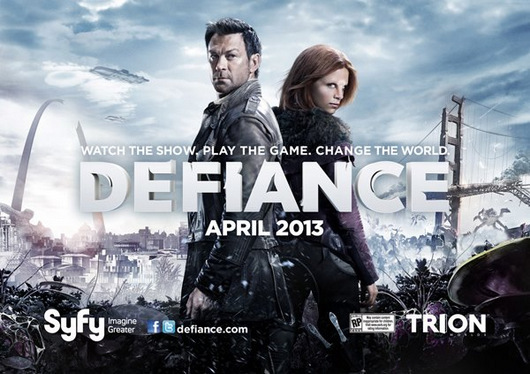 I checked out the newest SyFy series, Defiance, last night. Mixed feelings on the show. I stayed tuned throughout the entire two-hour premiere, so that says something. Entertainment Weekly posted that the show generated SyFy's highest rating since 2009, and it's highest rated premiere since Eureka in 2006. The series mixes two popular science fiction themes of late: aliens and the apocalypse. From what I could gather from the show, the gist of it is that a number of different aliens came to Earth to escape their dying star system. They assumed Earth was uninhabited. Obviously, this was incorrect. After many years of war, there was something of an armistice between humans and most of the aliens. That's where we are now. The show, on a visual level, is reminiscent of the Mad Max movies from the 80s. Much of the earth is barren and very dangerous. The big shots at the SyFy network want Defiance to restore the network to its Battlestar Galactica heights. We'll see. Fox had a similar show on last year called Terra Nova, and it was a bomb. Here's to hoping this one is better! Tim Goodman of The Hollywood Reporter says, "...even if tonight's two-hour premiere doesn't hook you, stay patient and let it find its footing." I'll take Tim's advice and give it two more episodes before rendering a verdict. I mean, I liked Revolution at first, but quickly grew to dislike it. Maybe my neutrality can be shaken with a strong next two episodes. On the casting front, two former Dexter stars appear on Defiance. Julie Benz, who played Dexter's wife on the first few seasons before -- spoiler alert -- she is killed, plays the Mayor of the city of Defiance. Jaime Murray, who was Dexter's psychotic love interest in season two before he -- spoiler alert -- killed her, also appears. Though I honestly don't remember seeing her in the episode. Lastly, actress Mia Kirshner stars as the owner of a brothel in Defiance, and sister to the Mayor. I used to looooove her on The L Word. Of all the crazy and hot lesbians on that show, she was the craziest and hottest (next to Jennifer Beals, of course). So, there are some pluses and minuses to Defiance. I'll keep you in the loop on how it evolves.